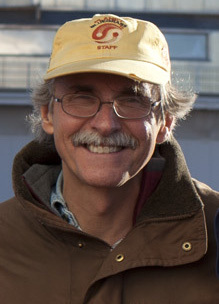 John Spencer is a member of the New Horizons mission science team, and the coordinator and self-described "cat-herder-in-chief" for the effort to find a Kuiper Belt object flyby target for New Horizons. I'd like to tell you a bit about our recent Kuiper Belt object search observing run on the Subaru telescope on Mauna Kea Observatory in Hawaii, one of a dozen or so KBO search runs we're doing this year. But first, I want to thank everyone who's helping out with the crucial task of sorting through our terabytes of data for those elusive KBOs, using the Ice Hunters site! It's amazing the effort people are putting into this, and I hope we can all reap the rewards sometime in the coming decade, when we get mankind's first look at one of the typical members of the Kuiper Belt. 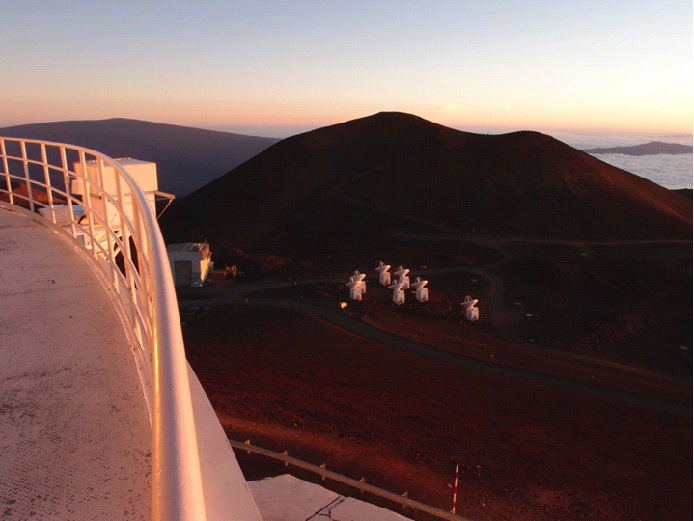 I used to go to the telescope all the time, starting when I was a postdoc at the University of Hawaii – Mauna Kea was where I learned the ropes. 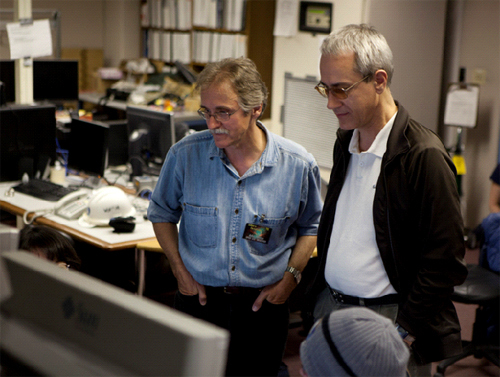 But these days I spend most of my time working on space missions– a thrilling business, but one where you do your “observing” at your desk, or in teleconferences, or at meetings, thrashing out the details of observations to be made millions of miles away and relayed back to your computer for analysis after the fact. When I do use Earth-bound telescopes these days, I usually do it over the Internet, controlling the telescope from my desktop thousands of miles away. 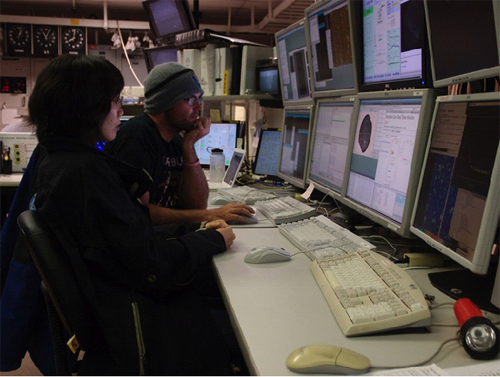 For the KBO search effort, I’ve mostly been helping to plan observations to be made by other teams, at the Subaru or Canada-France-Hawaii telescopes in Hawaii, or at the Magellan telescopes in Chile. So I was excited at the prospect of going back to Hawaii in person for one of our Subaru runs. Even then, I expected to be operating the telescope from a control room in Hilo at the base of the mountain, not from the summit – it’s logistically easier to observe at sea level, and astronomers’ brains work better at 2 a.m. if they’re not starved of oxygen at 13,500 feet. But it turned out that Subaru had a staff shortage, and wasn’t able to field two of its own people to be on the summit, at the telescope itself, for our run. 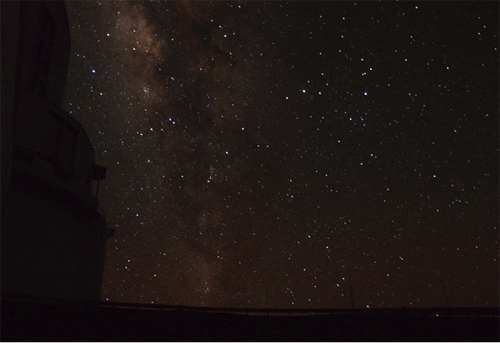 That’s a problem, because working alone overnight in such a remote place, amid such massive equipment, is not only lonely but dangerous, and observatory rules require at least two people at the telescope at night. So we astronomers (myself, Dave Tholen from the University of Hawaii, and Dave Trilling from Northern Arizona University, plus our assigned Subaru support astronomer Miki Ishii) had to be at the summit too for our two-night run in early July. This was good news as far as I was concerned – I didn’t mind braving the altitude and the remoteness if it meant being able to recapture some of the romance of the old way of connecting with the universe, up there on the mountaintop. 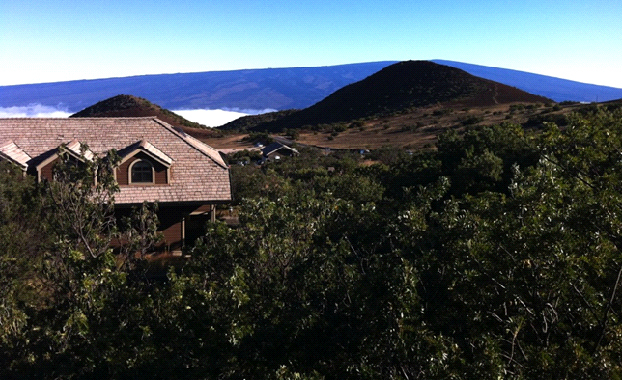 So, on June 30, after the long flight from Denver to Kona, I left behind the coconut palms of the Hawaiian coast and drove 9,000 feet up the mountain to the observer’s dormitory. 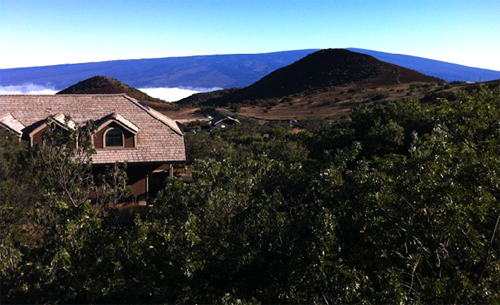 The dormitory, Hale Pohaku (Hawaiian for “stone house”), is perched near a tree line on the flanks for Mauna Kea in a scrubby forest of native mamane trees, with a stunning view of the vast bulk of the volcano Mauna Loa to the south. Hale Pohaku used to be my home away from home, but I hadn’t been there for eight years, so it was great to be back and slip into the familiar old routines, and see familiar faces. Joining us at the dormitory was a film crew from the New Horizons team at the Johns Hopkins Applied Physics Lab, who were filming a piece about our observing run that I hope you’ll soon be able to watch at this site. After the sightseeing, it was down to business. We made some calibration observations of the evening sky, and then had about an hour to wait until the part of the sky where we knew our KBOs were hiding rose high enough for us to look at it. We had a quick look at a couple of near-Earth asteroids (NEOs) while we were waiting, to check their locations in order improve their orbits, and to get a feel for how to use the telescope and its giant camera. Josh and Miki were amazingly efficient at getting us pointed in the right direction and properly focused. The images came in, a sparse scattering of stars against a black background, and Dave Tholen, copying the images to his laptop, was able to find one of his favorite NEOs, Apophis, in no time. Then we finally turned our sights to the KBO search fields, in the heart of the Milky Way. On the monitors, the blackness of space was suddenly replaced with a blaze of thousands of stars. We knew there was no way we were going to pick out our KBOs, Apophis-like, in real time, among all those Milky Way stars. Our job was just to patiently work through our pre-determined pattern of telescope pointings (a 3-by-4 mosaic of adjacent fields), keeping a close eye on the focus to make sure that the data were of the highest possible quality, and being ready to repeat fields if the quality was bad due to clouds or poor seeing. We visited each field three times during the night so we’d be able to use the motion of the KBOs to separate them from the background stars. It was a great night – everything went smoothly, the images looked fabulous, and no fields needed to be repeated. The lack of excitement made it hard to stay awake as the small hours dragged on. Finally, our part of the Milky Way began to set in the west, and we had a short time to pick up a couple more NEOs for Dave Tholen before heading down the mountain for some sleep. But then something went wrong. A very peculiar-looking image, with curved star trails, appeared on the monitor – the camera was obviously no longer rotating to keep up with the rotation of the heavens. Error messages that Josh had never seen before started streaming onto the console, and nothing with the camera was working anymore. Though it was 5a.m., Josh called down to Hilo for backup, and spent an hour on the phone in fruitless troubleshooting, while the rest of us, unable to help, dozed fitfully in corners of the control room. Finally he gave up, the folks in Hilo promised to send a team up to the summit to take a look, and we all drove down to Hale Pohaku in the morning light for some much-needed sleep. Fortunately we’d planned our observations carefully, and had covered the highest-priority fields, where our KBOs were most likely to be found, on the first night. So we got maybe 70% of what we came for. While most telescope and instrument problems aren’t this serious, they are an expected part of the job, an occupational hazard like clouds. So when we flew back to the mainland, just in time for the July 4 celebrations, with our laptop hard disks full of fresh data that might just include a target KBO for New Horizons, we were well satisfied. Soon, we’ll be posting those data on Ice Hunters- please join us there if you want to help us find those KBOs!